Covered cloisters of Franciscan Friary. Founded by Sir William Gorbrigge, damaged in World War Two. Church was to north across Queen Street. Built between 1260 to 1300. Monastery of Greyfriars founded in the early 13th century. 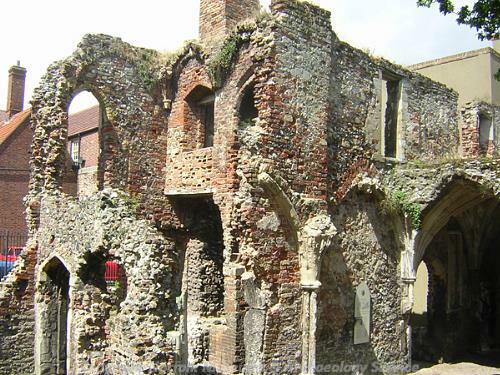 Remains scanty but include part of only vaulted Franciscan cloister remaining in England. (S5) notes 'corner of a cloister remains by Fountain Tavern'. Work carried out by J. K. Knight for M.P.B.W. revealed the western wall of the western range beneath post-medieval alterations. M. Langham-Lopez (HES), 20 May 2013. 1996. Analysis of remaining upstanding walls revealed that west end of church had been extended, and cloister was one bay shorter north to south than previously thought. Some later domestic changes. 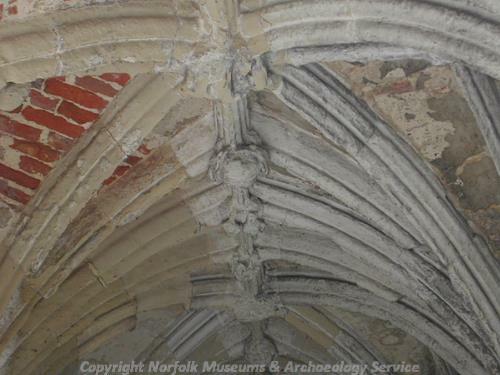 Work by Norfolk Archaeological Unit for English Heritage who presumably hold the report in archive. E. Rose (NAU) 29 July 1998. (S7) in file. Schedule enlarged 1998. See the new description for full history including post dissolution use for Trained Bands and as residences, and full description; account of walls found under Queen Street in 1896. No.9 Queen Street is listed Grade II, see (S7), as a 17th century house completely encased in the 19th century. It has a 17th century door in cellar, a blocked mullioned window and a first floor ovolo moulded beam. This stands on the site of the church. E. Rose (NLA) 23 March 1999. --- Article in serial: Gurney, D. and Penn, K. (eds). 1997. Excavations and Surveys in Norfolk 1996. Norfolk Archaeology. Vol XLII Pt IV pp 547-564. p 552. --- Article in serial: Coad, V. 1980. Greyfriars' Monastery. Archaeological Journal. Vol 137 pp 308-309. --- Article in serial: Bately, J. and Olley, H. 1898. 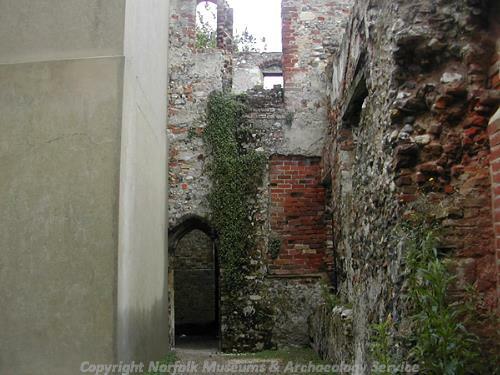 Recent Discoveries on the Site of the Grey Friars, Great Yarmouth. Norfolk Archaeology. Vol XIII pp 21-32. --- (No record type): Clarke, R. R. and NCM Staff. 1933-1973. Norwich Castle Museum Record Card - Medieval. Yarmouth (Great) . <S1> Monograph: Palmer's History and Perlustrations of Great Yarmouth..
<S2> Serial: Blomefield, F.. 1805-1810. An Essay Towards a Topographical History of the County of Norfolk.. Unknown - USE SPECIFIC VOLUME WHERE KNOWN. <S4> Publication: Harlech, A.M.. 1955. Regional Guide East Anglia and Midlands. p.27. <S5> Publication: Martin, T.. c.1740. Church Notes. <S6> Article in serial: Gurney, D. (ed.). 1996. Excavations and Surveys in Norfolk 1995. Norfolk Archaeology. Vol XLII Pt III pp 397-412. <S7> Scheduling record: English Heritage. List of Buildings of Historical and Architectural Interest. <S8> Article in serial: Wilson, D. M. and Hurst, D. G. 1966. Medieval Britain in 1964. Medieval Archaeology. Vol IX (for 1965) pp 170-220. p181.